Esquire’s Maxine Wally is good at her job, because she’s very nearly got me convinced that I should put a pickle on an Oreo. 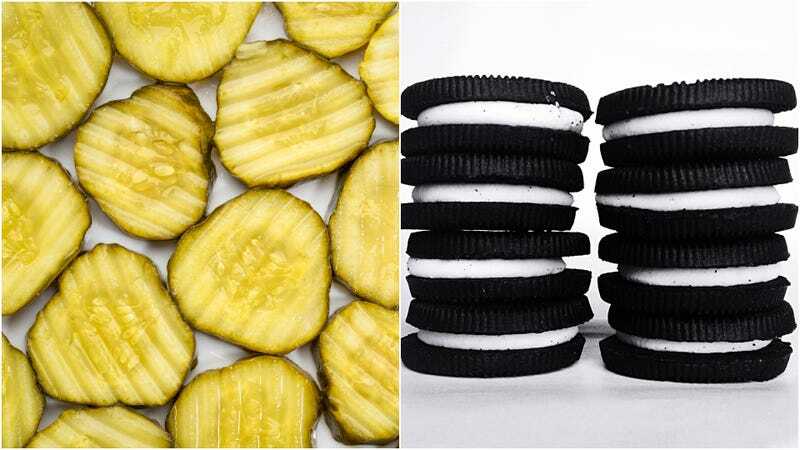 In a piece titled “Oreo Cookies Are the Real Pickle Pairing Your Taste Buds Deserve,” Wally makes a very persuasive argument for placing a little pickle slice atop a chocolate sandwich cookie—a trend she discovered on Instagram and somehow convinced the guests at a dinner party to attempt. Wally is a good writer, and if descriptions like “the hot, vinegar-laced pickle both cut through the sugar and added a succulent dimension to the Oreo” don’t make you just a little curious about this latest dessert abomination, then perhaps nothing will. But there’s another issue we at The Takeout feel we should address, and it is this: If we’re putting pickles on Oreos now, that’s it. That’s the end. We have pickle-topped all the things, and “put a pickle on it” is over. Put a spear in it, because it is done, and yes, that is a pickle pun, because we put pickles in journalism now, too. Nicole Krasinski of State Bird Provisions told us all about her beloved pickles, Gruyere cheese, and butter and sandwich; also in the ‘wich category, we’ve praised the pickle-topped St. Paul egg foo young sandwich, and the New York Times wants us to try peanut butter and pickle. Pickles can be found in salad dressing. Pickles in beer! Pickle slushies! It’s a lot, and it’s time to call it. Time of death: now. Cause: Oreo pickle combination. I am not inherently opposed to this Oreo situation. It is, in fact, entirely likely that the next time I’ve got Oreos in the house, I’ll give it a try. Thanks in advance for that adventure, Maxine Wally. But it’s time to move on to the next thing we all collectively try for a few months before finally reaching maximum weird. I vote for red onions, personally. Might be good with Nutter Butters.